← Got something else–an opossum! Posted on March 14, 2010	by Lou Murray, Ph.D.
It’s cold (relatively speaking), windy, and my allergies are acting up. But flowers are blooming everywhere and bird songs fill the air. Must be March in southern California. I promised myself that this would be my best organic garden ever, and so far that’s what it’s shaping up to be. I’ve been working on growing more fruits and vegetables in our yard for several years now, and this is the year that I expect to reap the reward for my past efforts at planting fruit trees, bushes and vines, other perennial flowers and vegetables, as well as building a chicken coop, resetting the pavers in back, and incorporating raised garden beds into our landscape. After removing a misshapen magnolia tree and reducing the size of the herb garden, I installed these three raised beds from Gardeners Supply Company for growing vegetables. In addition to my new raised beds in back, I have two vegetable gardens in front: The Garden of Infinite Neglect and the Garden of Perpetual Responsibility. The Garden of Infinite Neglect is looking less neglected with its refurbished flower border and new vegetable plantings. In the Garden of Infinite Neglect, I have everbearing crops of Scotch Blue-curled Kake and Collards. But the Green Savoy Cabbage crop was a bust, and I’m feeding the leggy, non-heading, insect-eaten cabbages to the chickens one by one. I have some Lutz Greenleaf Beets that are so old that I dare not use them for anything except beet greens. I just never got around to harvesting the things. You can see why I call this my Garden of Infinite Neglect. I let some chard go to seed there last year and the seeds fell all over the place. I’m now harvesting dozens and dozens of chard seedlings at 1-2 inches high as microgreens. They’re fabulous in a salad. So neglect can pay off sometimes. However, those chard seedlings sprouted AFTER I planted my new rows of Rainbow Chard, Lutz Greenleaf Beets, Chioggia Beets and Bok Choy. Except for the Bok Choy, I can’t tell what’s what. Oh well, it will all sort out by harvest time. I have a couple of new rows of Golden Wax Beans that have their first true leaves, a patch of patty pan squash (3 heirloom varieties, Bennings Green Tint, Yellow, and White) that has yet to sprout, and a Millionaire eggplant left over from last year that is reblooming for the 2010 season. Somewhere under the kale, I have a couple of Green Bunching Onions that are going to seed. I save seed from heirloom vegetables, so I’ll just let them go to flower and set seed. When the flowers are dry, I’ll harvest them into a paper bag and shake out the black seeds. Elsewhere in the Garden of Infinite Neglect, I have a patch of yellow onions that are coming along nicely. Maybe I won’t neglect this dry, pathetic patch of dirt so much this summer. Garden of Perpetual Responsibility has fewer weeds than usual, thanks to my pulling weeds frequently to feed the chickens. 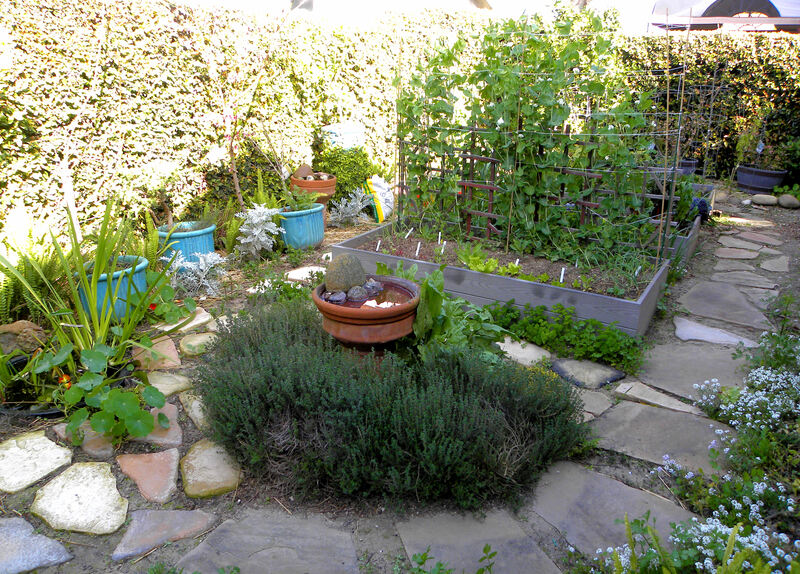 The Garden of Perpetual Responsibility is beginning to get more morning sun as the seasons progress. The artichokes are growing nicely, as are the red onions. The rhubarb hasn’t come up yet, and I’m beginning to worry that it didn’t make it. Most of what else is in there is white Lantana to attract butterflies, Lily of the Nile (perennial flowers), Nemesia, a lovely blue perennial and self-seeding flower that bees love but that desperately needs thinning, two thornless blackberry bushes that are still dormant, and weeds. No end to the weeds. Maybe this will be the summer that I get them out BEFORE they set seed. 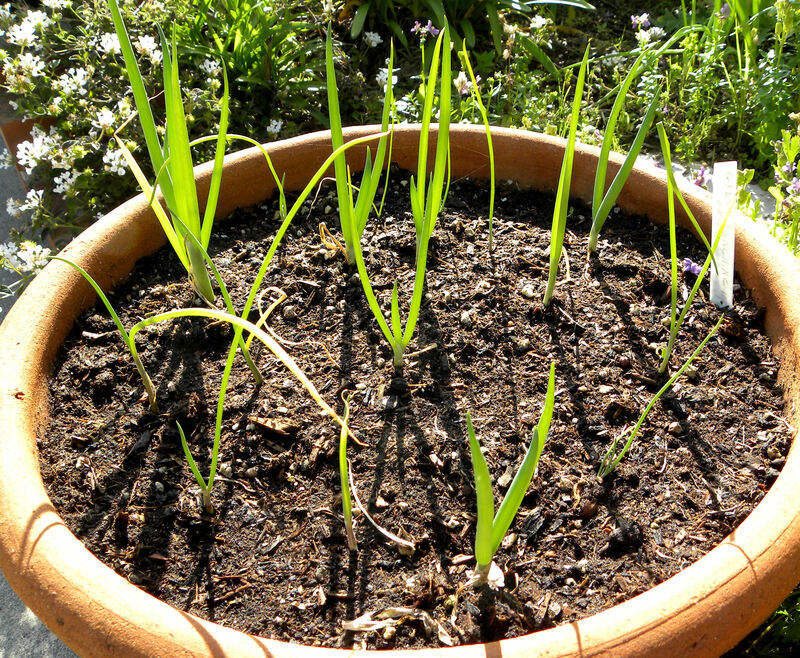 I grow green bunching onions continuously in these shallow bowls, adding fertilizer whenever I plant new seeds. Due to lack of space and sun, I also garden in containers. I’ve been growing green onions with a continuous harvest for about a year and a half now. Whenever I have half the onions in a bowl pulled up, I plant the other half. With two bowls going, I haven’t needed to buy green onions until this week. I guess I need three bowls of onions. 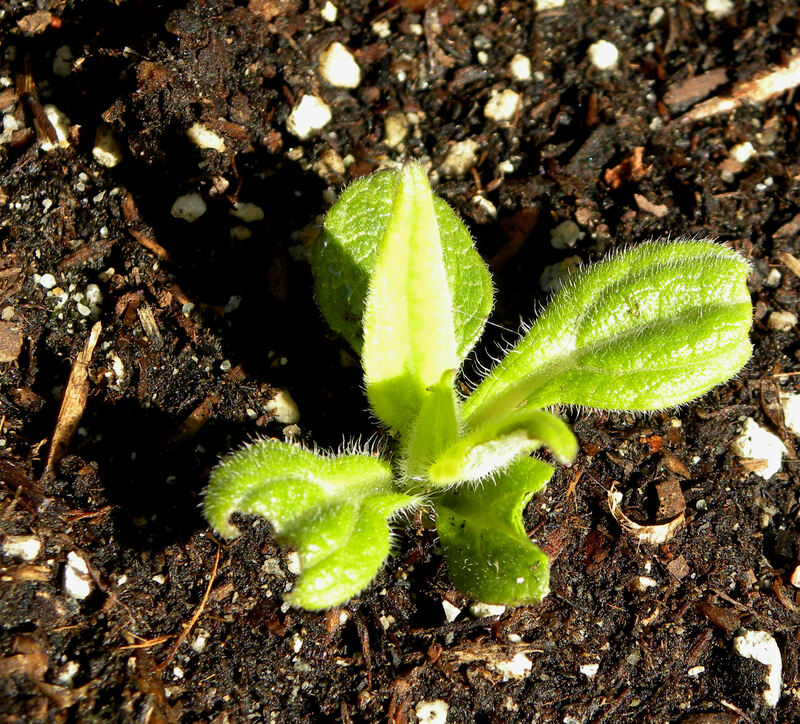 The container of horseradish has a lot of healthy looking sprouts. The horseradish is up and doing well. I won’t be able to harvest any roots until the plant goes dormant in the winter, so this is pretty much a 10-month committment. I planted ginger before the horseradish, but it hasn’t broken ground yet. I’m assuming that because ginger is a semi-tropical plant, it is waiting for warmer weather to sprout. I have three sunchoke sprouts above ground now. This one suffered some insect damage to the new shoot. I’m experimenting with sunchokes this year, aka Jerusalem artichokes. I’ve never grown them before. I know that sunchokes are invasive, so I’m growing them in Smart Pots, which are large, felt-like containers. After the sunflowers die back in late summer, I’ll harvest the tubers from the Smart Pot. 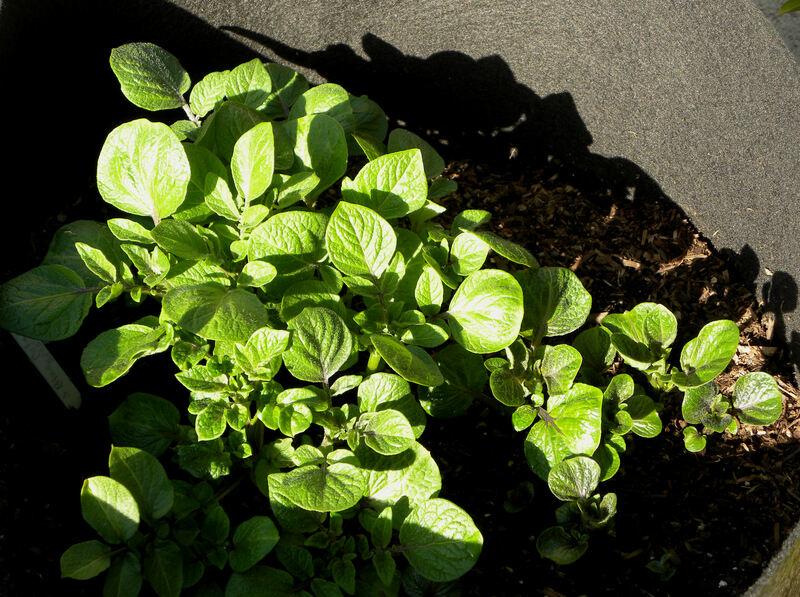 Blue potatoes growing in Smart Pots. I’m also growing blue potatoes in Smart Pots. I planted three blue potatoes in each of two Smart Pots, and they’re growing like gang-busters. The loose potting soil in the felt pots should make them easy to harvest. My Panamint Nectarine is in full bloom right now, but the Snow Queen Nectarine is still dormant, as is the Santa Rosa Plum, Katy Apricot, all three apple trees and the two Asian pear trees. Peaches on the Florida Prince peach tree. It looks like it will be a good year for my Florida Prince Peach tree. The August Pride Peach has just finished blooming, with about three dozen peaches set, while the Babcock Improved Peach is just now beginning to bloom. 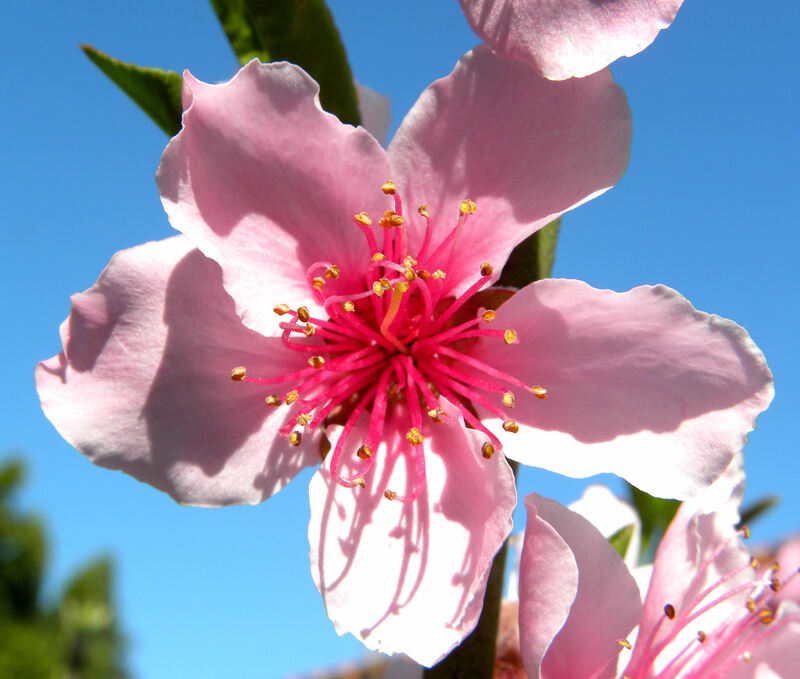 With three peach trees that bloom at different times, my harvest is spread out over a longer time. Flower buds on my Bearrs lime tree. The two lime trees are beginning to bloom, a bit after the Eureka lemon trees. 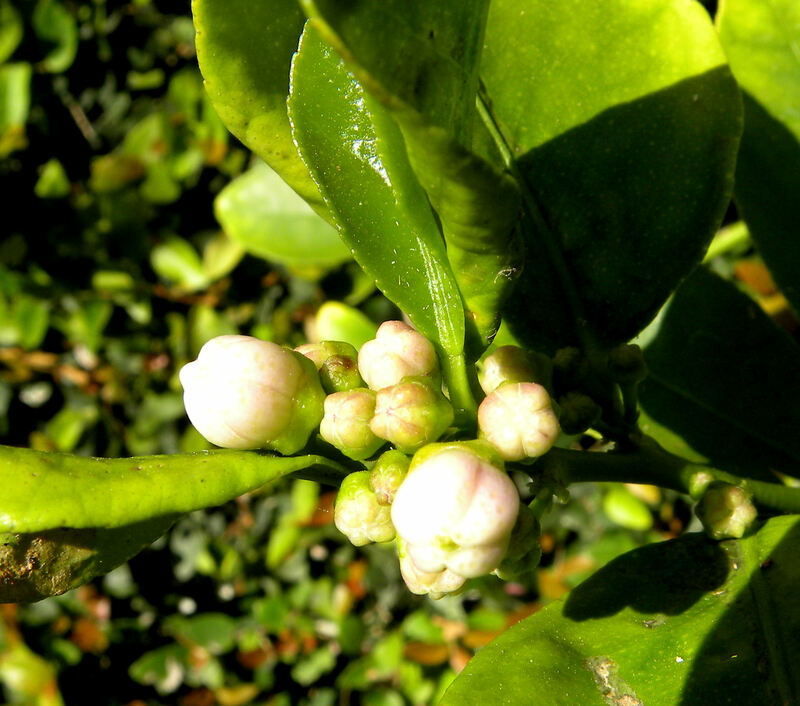 The Meyer lemon and orange trees have no flower buds on them yet, but it’s still early for them. The artichoke tree has loads of buds on it this years, so I’m hoping that some of them set fruit. The avocado tree that I planted is a semi-dwarf, and has been a very poor producer. This year it got more water than usual because the rain barrel overflow spout from our new gutter is directed at the roots of the avocado tree. I am hopeful. 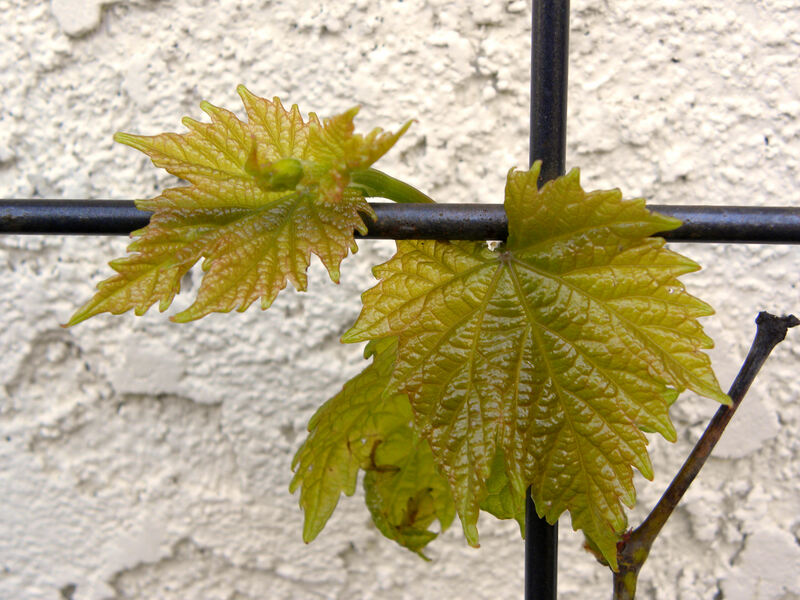 The grapes have sprouted their new growth of spring leaves. My grapes made it through the winter and have their new leaves. They didn’t flower last year, but I’m hoping that with more established roots that they’ll grace us with some Thompson Seedless and Seedless Red Flame Grapes this year. And that’s what I seem to have the most of in my garden. Hope! 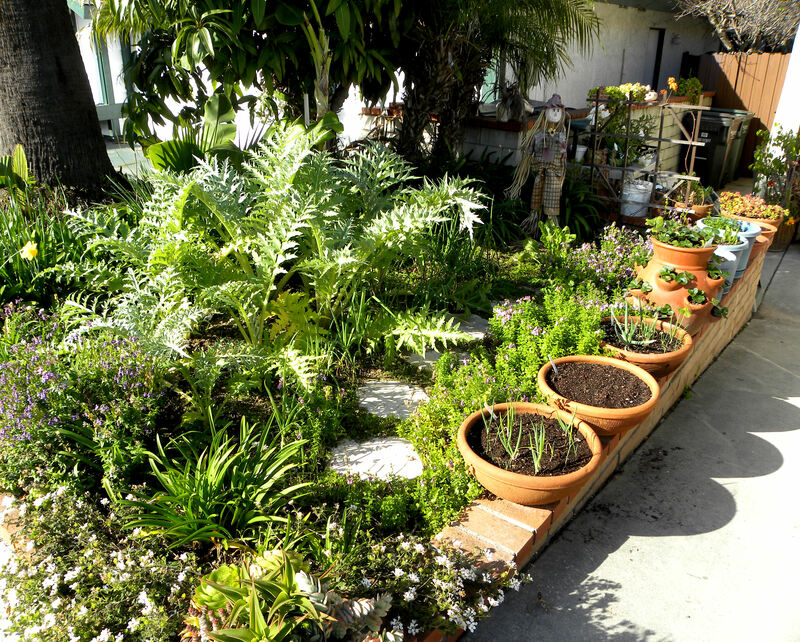 This entry was posted in Uncategorized and tagged backyard chickens, chicken coop, flowers, gardening in containers, hens, organic, photos, southern California, urban chickens, vegetable garden, vegetables. Bookmark the permalink. I love looking at photos of your garden. So many different things happening. 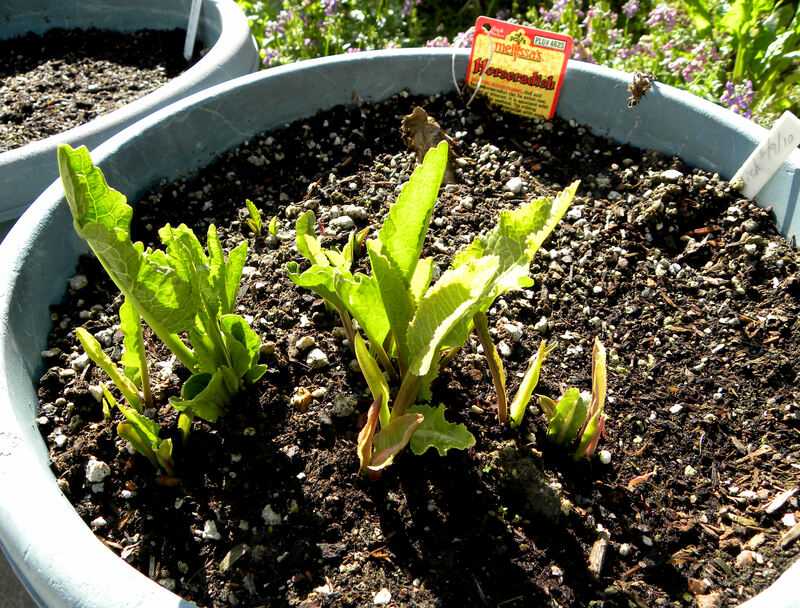 I didn’t know that horseradish can grow in a pot. I always thought of it as a plant that needs a lot of room for root. Hi Vrtlaricaana, I grew horseradish in a container once before, but it might have been a larger container. I won’t know until fall if this experiment worked or not. If the pot limits the amount of root harvest, all the better. How much horseradish does one need anyway? In our case, not much. Hi Victoria. 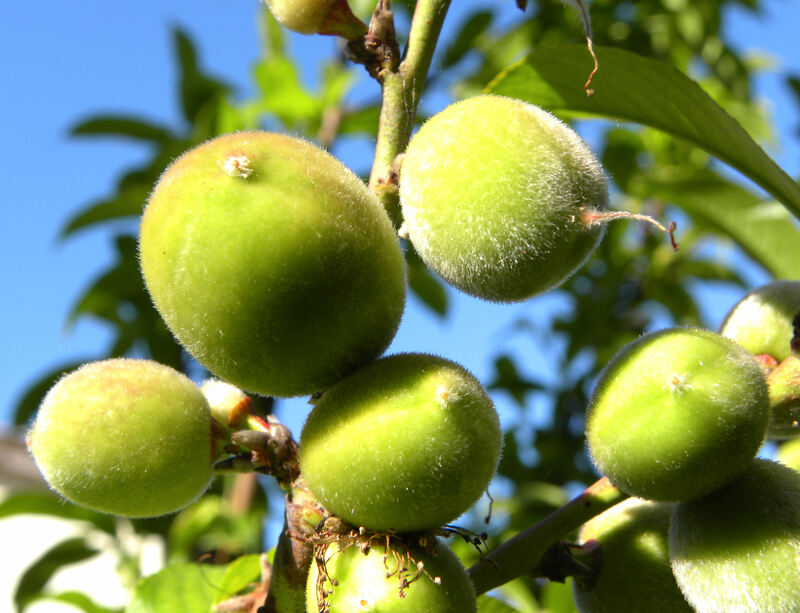 It’s common for stone fruit trees to alternate a heavy crop with a light crop. Next year should be a good year for your young tree, but it won’t really bear heavily until it’s been in the ground for five years. I hardly fertilize mine at all, just a sprinkle of organic fertilizer (can’t remember, but about 2-3-2) and some homemade compost. 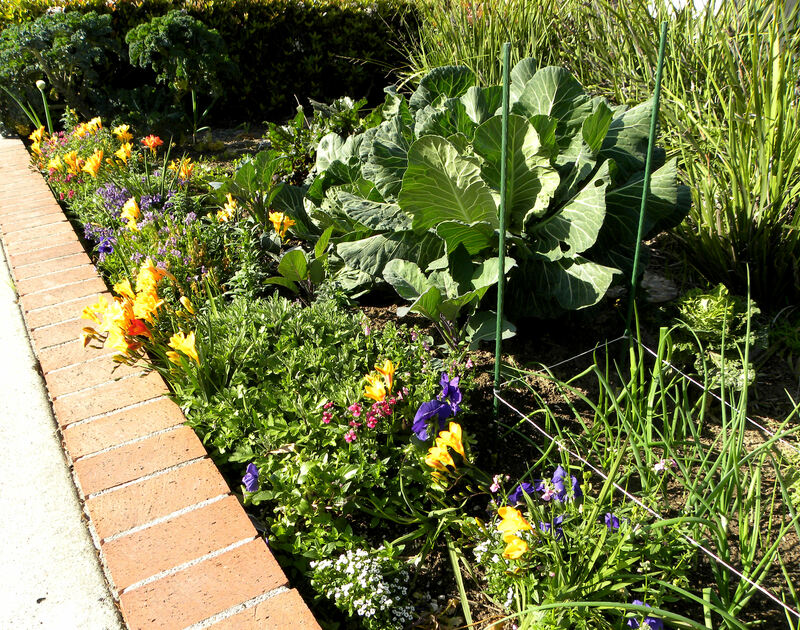 It’s important to water it well in the fall before it goes dormant for the winter. Enjoy your peaches!